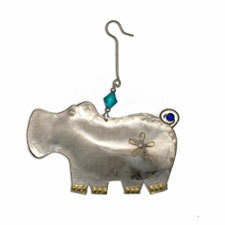 Our shiny metal double-sided hippo ornament will add a sparkle to your tree this year. He sports a flower on his flank and a curly tail with a crystal for a colorful touch. You will appreciate the quality of this hand-made piece as it becomes a cherished family ornament and will be happy to know that you are supporting communities of craftsmen who are able to sell their items at a fair wage.